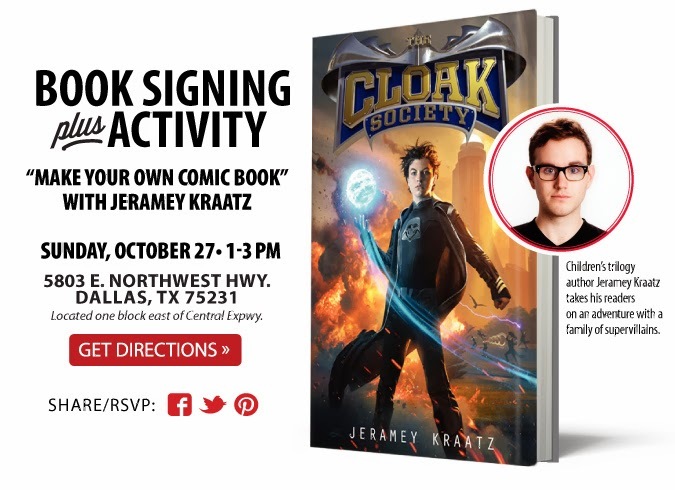 Half Price Books Dallas ~ Cloak Society Author Signing +Comic Book Activity 10/27! Visit Half Price Books at the Dallas Northwest Highway location this Sunday (10/27) from 1-3pm to meet childrens Trilogy author Jeramey Kraatz. The Cloak Society author who takes his readers on an adventure with a family of supervillians will be on hand to sign his new book Cloak Society-Villians Rising . Then stick around as he hosts a “Make Your Own Comic Book” activity. Visit HPB for more information. Previous postFt. Worth Stockyards Halloween Treat Street ~ 10/31! Next postPeter Piper Pizza Halloween Party ~ FREE Candy + Prizes (10/31) 5-8pm!